Pine Grove Cottages is located on beautiful Beach Lake. With both heat and air conditioning, each cottage can sleep up to 6 people. Linens and towels are provided. There is a small kitchen and a porch area with chairs. A tour-de-force 600 kilometer ride that will inspire you to fly high and reach your goals. Leaving from the breakfast buffet at the Holiday Inn Express in Easton we head southward, toward Philly. The first fifty miles are a relatively easy spin through the suburban sprawl of Bucks and Montgomery counties, still asleep in the early morning. The route uses the 202 bypass trail and the Cross County trail, threading through this heavily populated area. Enjoy the quiet, but ride fast to bank time; you'll need it later. Oh, but maybe stop at one of the cafés at the foot of the Manayunk Wall to sip a macchiato. Try to look phantastic. But then get rolling. You need to bank time. The route follows the Schuylkill eastward along Kelly drive, past the lighthouse on Turtle Rock and on to the Philadelphia Museum of Art where you will pause to draw inspiration and strength at the foot of the museum steps, the Rocky Steps, where there is an information controle. The route then reverses to follow the other side of the Schuylkill westward along the Schuylkill River Trail all the way to Gibraltar, near Reading. A section of the SRT past Pottstown is crushed stone and gravel, suitable for most tires. After the controle in Gibraltar we continue on the SRT to the city of Reading where we leave the river. Soon the "fun" begins climbing the switchbacks up Duryea Drive. Your reward for summiting Mt Penn is the breathtaking vista from the Reading Pagoda, roughly halfway to the overnight controle. From the Pagoda the route now heads North East, eventually leaving the mountainous ridge of the Reading Prong and entering the Great Valley rolling farmland at Fleetwood PA. Here the riding is similar to the riding near Lancaster. Crossing the Lehigh River at Catasaqua as the sun sets, you will see the glow of Allentown to the South. There are several replenishment options through this section. Find a place to eat and stock up with supplies. The controle in Wind Gap at the foot of Blue Mountain begins a section of night riding through difficult terrain with relatively few services. 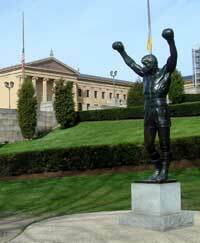 Think of Rocky Balboa as you climb the steps of the Ridge/Valley Appalachians to the Pocono Plateau. Feeling strong now? In about 40 miles you reach the Promised Land (with salvation in the form of a 24hr convenience store) and the highest elevation of the ride (about 1800 ft higher than the Rocky Statue). Continuing North beyond Hawley you soon arrive at the overnight controle, Pine Grove Cottages at Beach Lake, PA.
After a well deserved rest, your journey now turns to the East as the route returns to more familiar PA Rando roads. PA Rando regulars will start to recognize the territory crossing the Roebling Aqueduct at the conflux of the Lackawaxen and Delaware. There is the infamous climb to a postal controle at Eldred NY (El Dread!) and the scenic Hawk's Nest before reaching the Port Jervis controle. From here the route follows the Delaware to Wallpack, where we climb Kittatinny Mountain on Old Mine "Road" (gravel, and potholes suitable for most tires) and freshly paved Millbrook Rd into the penultimate controle in Blairstown. Returning to the Delaware and the last few grunts on Foul Rift Rd, the route returns triumphantly to Easton over the Free Bridge, through the center square roundabout, and up Northhampton Street to the finish at the Holiday Inn Express. Pre-payment only. Day-of-event payment is not available for this event. A complimentary breakfast buffet will be provided before the ride, and a pizza/pasta buffet will be available after the ride. Registration includes sleep accomodations and food at the overnight sleep controle, Pine Grove Cottages. Drop bag service for one small bag is provided. There will be shared access to a shower at the start/finish, allowing you to clean up after the ride. A limited number of bunks will be available for "safety naps". If you need full overnight accomodations at the start/finish, please book a room for yourself. No lodging at the start/finish is included, but PA Randonneurs has reserved a limited block of rooms at the Holiday Inn that riders may book. Contact the hotel directly. Use group code RB3. Click here to make reservations.